HAMMOND, La. – Lantanas continue to be one of the most popular herbaceous perennials for Louisiana landscapes. Many varieties, some old and some new, offer a multitude of growth forms and flower colors. Lantanas are most commonly added to the landscape during spring and continue with flowers all the way through the fall season. The growth habit of lantanas can include a wide range of shapes, from trailing to mounding to upright. Trailing types reach a height of 18 inches and spread 3 feet wide. Foliage texture is finer, and flower colors in the trailing types are white, lavender and purple. Mounding and upright types actually belong to another species or group of hybrid lantanas. Mounding lantanas reach 30-36 inches tall while upright growers, including the old “ham-and-egg” type, can reach 4-5 feet tall – or even larger – in one growing season. Most lantanas, regardless of habit, are reliably perennial throughout Louisiana. Sometimes, however, some plants will come back the second and third spring less vigorously than the previous year. The relatively new Bandana series of lantanas are the most truly mounding of all the mounding-type lantanas. One of the reasons they have been chosen as a Louisiana Super Plant this spring is due to their neat, uniform mounding growth characteristic. Older mounding types like New Gold, Gold Mound and Silver Mound are great plants. But they still have aggressive growing habits that sometimes go beyond what some home gardeners typically think of when a small, neat mounding-type plant is described. Bandanas reach 18-24 inches tall and 18-24 inches wide – a perfect size for many landscape settings and for container gardening. If you plant them in the ground, space individual plants 16-18 inches apart. Other strong points of the Bandana lantanas include the wide range in flower colors in the series. Varieties include white, lemon zest, cherry, cherry sunrise, light yellow, peach, rose, pink and red. Mixes of available varieties include the 2012 debut of lemon squeeze. Bandanas also are excellent fall-blooming lantanas. Some lantanas do not bloom well into fall, but Bandanas maintain flower color until first frost most years. Lantanas are great landscape plants and also do well in containers. They perform best in full sun. 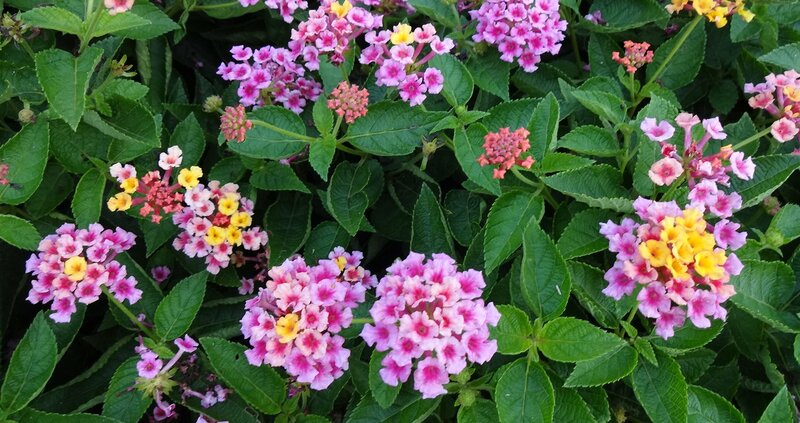 Lantanas are very drought-tolerant and deer-resistant. Irrigation is only needed in very droughty situations. Fertilize often to encourage growth – probably once at planting and again in late summer in a landscape bed. Sometimes older lantanas become stagnant in their growth and may not bloom well. In that case, prune the plants back about halfway and fertilize. New growth will produce new flowers. Also, watch plants for lantana lace bugs – the only main pest we have on lantana in Louisiana. But it has become more of a problem in recent years. Besides providing landscape color most of the year, lantanas attract butterflies like crazy. The Bandana lantanas will be great additions to a landscape in 2013. Tight mounders, great new colors and overall low maintenance should make them a smart choice for any landscaping project. Louisiana Super Plants are promoted to generate interest and awareness of these outstanding plants. Information is available through a wide variety of media. Look for information on Louisiana Super Plants in newsletters, magazines and newspapers and on television, radio and the internet at www.lsuagcenter.com/SuperPlants. In addition, look for signs showing which plants are the Louisiana Super Plants selections at your local nurseries.